Hey, guess where I was on Saturday? That’s right! 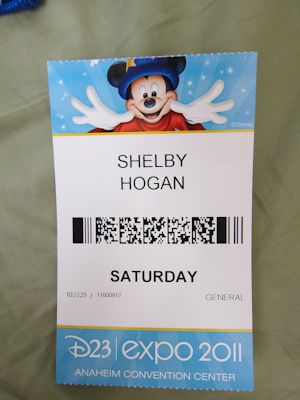 The Ultimate Disney Fan Event: D23 Expo 2011! It was very fun! But if I had to pick one word to describe my day, it would be “Lines.” Lots of people and lots and lots of lines. In fact, pretty much the only thing that didn’t have a line was the ladies restroom. I had been warned ahead of time by my friend who attended on Friday (it was a 3-day event, I did Saturday only) to either get there really really early, or get there late. Since I’m always so bright and chipper in the morning, I chose late. The general public was allowed in at 10:00 but had lined up hours earlier. I got there at about 11:00 and only had about 50 people in front of me, so it wasn’t bad at all. Did I mention this event was huge? This event was huge. Like 50,000 people over the course of 3 days. And Saturday was sold out. 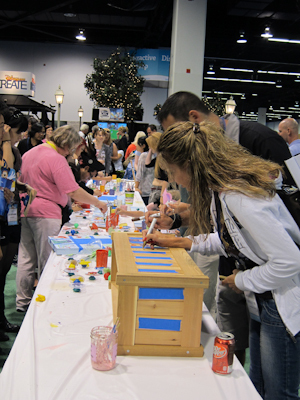 Like any convention, D23 had a number of seminars, panel discussions, and presentations. There was so much to see and do, but there was really only one panel discussion I really, REALLY wanted to see, and I just wanted to soak in everything else. That turned out to be a good plan, because the lines for the presentations and panels were 3 hours, or longer in some cases. I told you there were a lot of lines. I didn’t (couldn’t!) photograph everything, so I picked out some things I found cool. 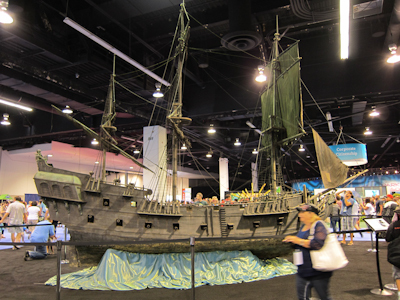 Like the Black Pearl–actually used for several scenes in the movie. The "waves" it's sitting on are SO authentic! 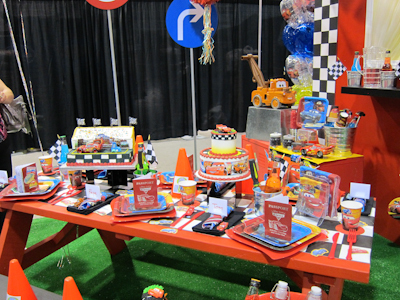 I couldn’t resist the Cars stuff, particularly in anticipation of Cars Land at the Mouse-Next-Door (California Adventure) opening next summer. 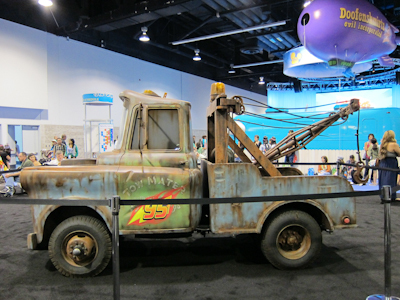 It's Mater! He never leaks oil. 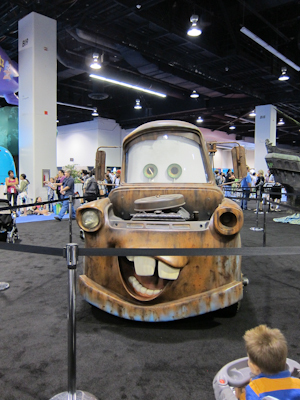 The cool part about Mater was his animated eyes. He's not as dumb as he looks. On a side note, I know a lot of people didn’t, but I really liked Cars 2. Sure it wasn’t the emotional developed storyline that the original was, but I thought for a James Bond action-adventure type movie it was great. 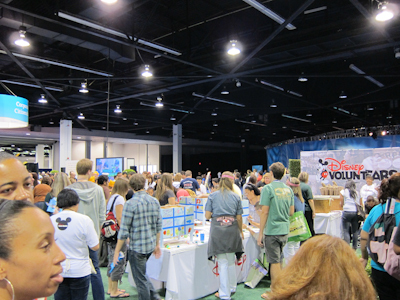 There was a pin and Vinylmation trading area that I thought would be more crowded, but it wasn’t given the rest of the expo. 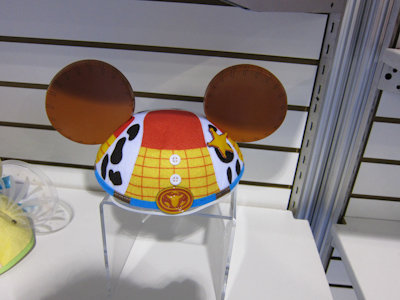 That section also had some new mouse ears being released in October. I thought these two were particularly cute. This one is for Anderson and Annika! Theo says "Pooh Bear HOME. 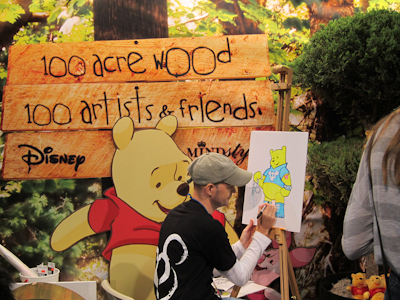 Pooh Bear HOME." 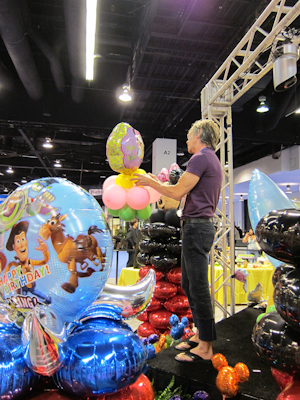 No joke, this guy was demonstrating making balloon structures. It looked surprisingly easy. 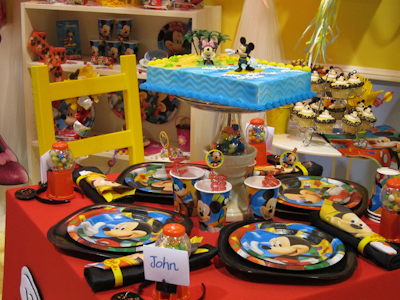 although if you were a true nerd parent, you’d throw a storybook party. 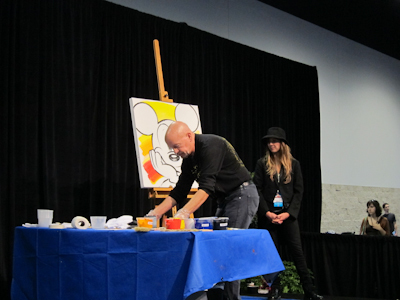 I loved seeing a demo and meet and greet with ACME artist David Willardson. He casually painted as he spoke to us. I’m always amazed by artists because I just can’t draw or paint, let alone talk at the same time. Bowling for dollars! Well, not dollars. 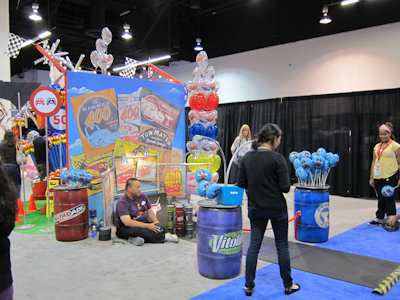 I played the bean bag toss, which I rather pathetically failed to win. I got two out of three, okay? I missed out on the main prize, which was stickers, but got the consolation prize, which was one of those mini-mylar balloons on a stick. Theo was a fan. And funny story about my t-shirt. 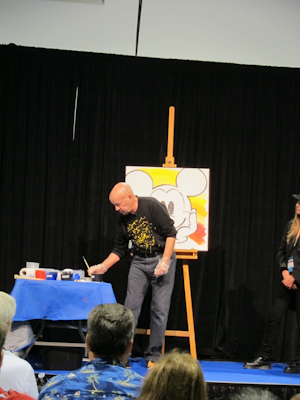 At the last minute I thought hey, I’ll make a t-shirt that says “Ask me about My Year With The Mouse”! How hard can it be? So I went to Michaels to get those iron-on transfers, and while I was there I realized that all of the transfers were for ink jet printers, and our shiny new color printer happens to be a fancy laser printer. So I end up calling and texting my friends to see if any had an ink jet printer I can borrow, and one of my fabulous friends did! The packaging of the transfers said to print on “the coated side” but it was entirely unclear which side was the coated side. To be safe, we printed two, one on each side of the paper. When I went to iron it on, I was certain I would pick the wrong one and stick it to my iron. The attention to detail is phenomenal. 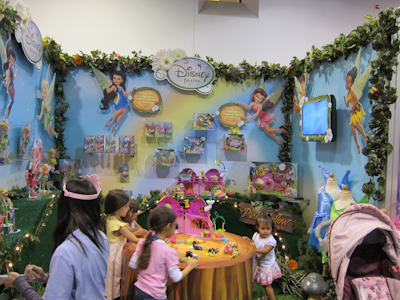 Only Disney would get every thread right on a doll you see from several feet away while you float on by. 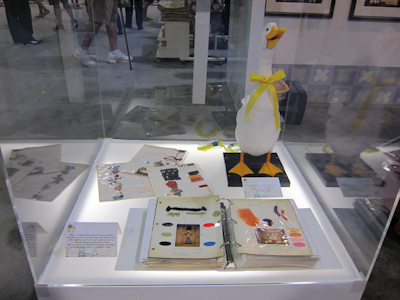 They also had one of the geese on display. 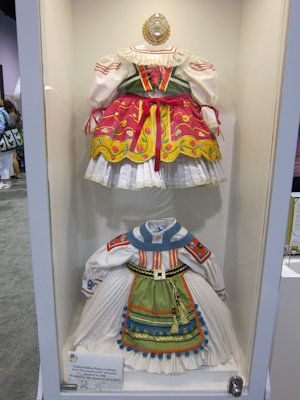 The Small World Village had a Nordstrom’s pop-up store, selling a new line of Small World baby and kid’s clothes. They were actually super-cute, but, you know, it’s Nordstrom’s and they weren’t exactly on sale. Did I mention I can’t paint or draw? 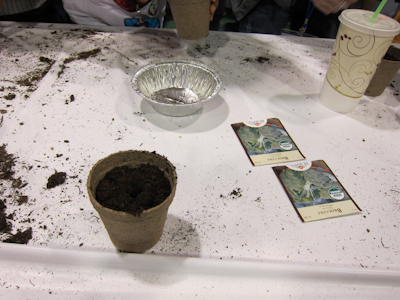 The other project was to get a cute little pot, fill it with soil, and plant two miniscule broccoli seeds in it. See, now THIS is something I can do! Now I happen to not have a green thumb. I have more like the Thumb of Death. Plants wither and die just looking at me. I killed two cacti once. One I over-watered, one I under-watered. I didn’t even know it was possible to under-water a cactus until I actually did it. I mean, I couldn’t even get my Chia pet to grow. So I was a little worried about this poor broccoli plant, but I think that it spent so little time in my hands it just might possibly live. Let’s hope so. 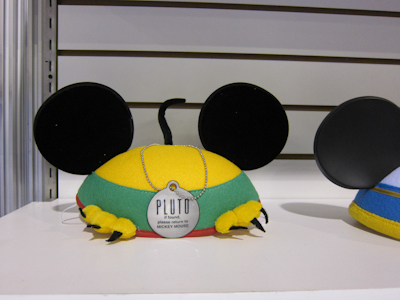 I’d hate to be the one who failed Disney Corporate Citizenship. After you did your project, you got a free reusable shopping bag with like green stuff on it and everything. 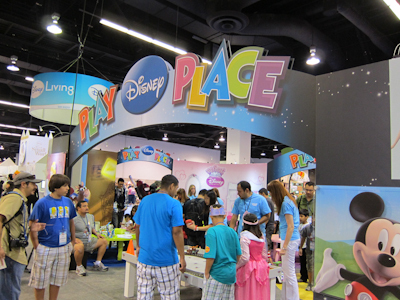 And by the way–stay tuned to MYWTM because I’m going to be doing a giveaway of a Bag O’Swag. That’s right–they give me stuff for free and I send it to you! Everyone wins! I guess! 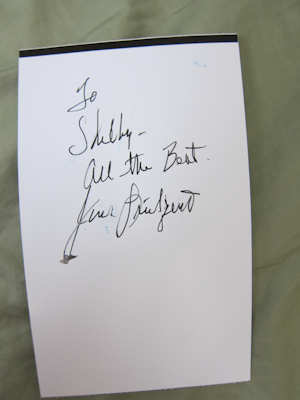 The highlight of the day, though, was getting to meet Disneyland’s first President, Jack Lindquist. 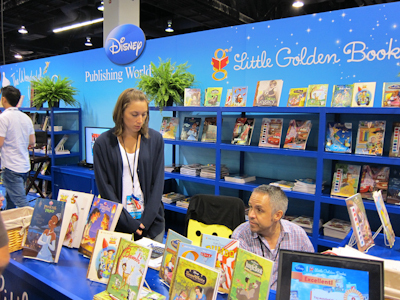 We’d just gotten his book In Service to The Mouse: My Unexpected Journey to Becoming Disneyland’s First President but I didn’t bring it along to be autographed because I thought we weren’t supposed to bring anything from home to be autographed. Instead I got to shake his hand and he signed my name badge. The super-cool thing is that he agreed to be interviewed for my little project here! Woo hoo! Stay tuned for that one too! 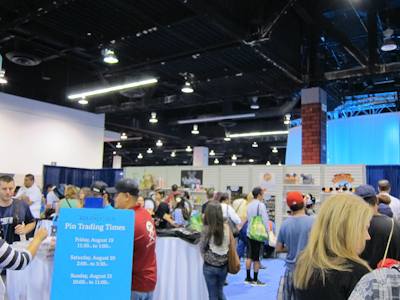 And that was the Show Floor of D23! 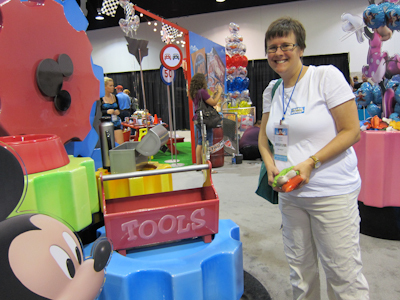 Everything Else D23 Expo, D23 Expo 2011, D23 Expo trip report, Jack Lindquist at D23, what was D23 Expo like? Just a question, how long are you going to do the blog? I’m assuming just this year, but that won’t give me enough time to recruit all of my friends! See what I did there? That makes it seem like I have a lot of friends. I mean I do have a lot of friends…I just…you know what, never mind.